"This is a delicious candy recipe of my late father's that he just loved to make. We loved it, too!" Butter an 8x8 inch square dish. In a medium saucepan over medium heat, combine brown sugar, white sugar, cream, corn syrup and salt. Stir until sugar is dissolved. Heat to between 234 and 240 degrees F (112 to 116 degrees C), or until a small amount of syrup dropped into cold water forms a soft ball that flattens when removed from the water and placed on a flat surface. Remove from heat and let cool without stirring until bottom of pan is lukewarm. Pour in vanilla and beat until creamy. Stir in nuts. Pour into prepared pan. Let cool completely before cutting into squares. See how to make sweet peppermint treats that positively melt in your mouth. This fudge turns out soft and creamy with an excellent brown sugar flavor. Make very sure to let the fudge cool to about 110 degrees before stirring to get it to that creamy texture. Awesome. I whipped it for 5 or so minutes on high speed after it was cooled a bit from the stove and that made all the difference. This is such an awesome recipe! 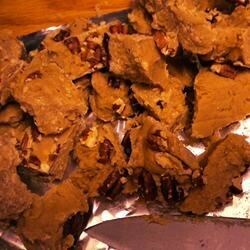 I had tried other Penuche recipes which failed horribly, but this one was perfect! Kudos to Paula!